Is the birth of a "red heifer" a sign or even an end time prerequisite? The Book of Numbers says that the ashes of a red heifer are required for the cleansing of the Levitical priesthood for Temple service. Given the prophecies about an end time Temple that needs cleansed priests, some Christians therefore herald each birth of a red heifer as an end time sign or precursor to the Third Temple and its altar. Find out what those saying this may be overlooking and also the surprising fine print about the 2018 red cow. "A BIBLE prophecy predicting the end of days is feared to come true after the first ‘red heifer in 2,000 years’ was born in Israel." 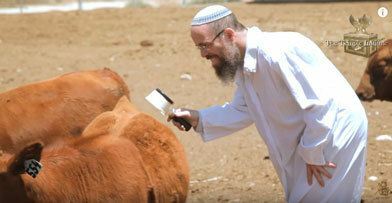 "We're waiting for the birth of a red heifer before the Third Temple appears..."
"The birth of a red heifer is an end time sign..."
In August 2018, this prophecy came around again when it was announced by the Temple Institute in Jerusalem that a red heifer was born that passed inspection by the rabbis. According to Numbers 19, a red heifer is needed to produce ashes for cleansing the Levites for Temple service. This red heifer birth is significant because red heifers are indeed extremely rare. The rabbis say that there were only nine red heifers in history starting with the first one in Moses' day. In the last 2000 years there has not been a single one . But that's not the end of the story as I'll explain next. Two Reasons This Is Not A "Sign"
Therefore, this is not quite a miracle or even a sign from God. For me, it's more like man trying to force things. I'm not saying it's wrong, rather it reminds me too much of how Abraham decided to "help" God out when he was told at nearly 100 years old that he would be the father of a great nation with his elderly wife Sarah. He took Sarah's advice of using her handmaid Hagar to produce offspring "on her knees" (where the Handmaid's Tale got the concept). That resulted in Ishmael, one of the fathers of the Arab peoples. Just as Ishmael was no sign or miracle but the outcome of human plotting, so it is with this "fertility clinic" produced cow. As for it being a prerequisite, the Jews may not even need a red heifer as I'll explain below. First, let's understand what this is all about better. Numbers 19 details the instructions regarding the red heifer. In the red heifer's ashes is found the only antidote for ritual impurity from contact with a grave (and other related non-living things) (Num 19:11, 14, 16). The Torah requires that the cow be without blemish (Num 19:2), just like any sacrifice to God (who doesn't want our rejects). Uniquely, it must have never been used to perform any physical labor (Num 19:2). The heifer must be three years old and perfect in its redness. Even its hooves must be red. It must also be totally free from any physical blemish or defect, whether internal or external. The presence of even two hairs of any other color will render it invalid. Significantly, Numbers 19 requires already clean priests and Levites (non-sons of Aaron who assist the priests with much of the grunt work) to perform the sacrifice (Num 19:3, 9). This means to produce the red heifer ashes, you need a high priest who does not need the purification of the ashes already! This was not too hard a requirement for the successive high priests in Israel (such as Aaron's son Eleazor Num 19) since they probably had ashes from previous heifers to use in the preparation of the next sacrifice. They also had the benefit of an priesthood-friendly society they were raised in to protect them from defilement from the dead. Original Red Heifer's Ashes Needed, Too? Some opinions maintain that the newer ashes were always mixed together with a combination of the previous ashes. One way of understanding this, is to the view this mixture of old and new ashes as being yet another precautionary measure... actually, as a kind of insurance policy. But in the meantime, let the truth be known: there is nothing to stop the people of Israel from raising a new red heifer, from birth, and preparing it in the manner we have described in these pages, and raising children in purity to carry out the procedure - even without the original ashes. On the contrary: we may be in doubt as to the true nature of any discovery that is unearthed whose authenticity cannot be completely verified. But a perfect heifer, born and raised under a controlled environment, would be fit to be used for the Temple. And that is precisely what is being done today. "Animal Sacrifices!?" = Crucifying Christ Again? Just a short note here that I know to include for the animal lovers who are reading. I say this because every time I bring up animal sacrifices in prophecy, either before the Great Tribulation at the Third Temple  or animal sacrifices in Millennial/Fourth Temple while Jesus reigns as king , I get confused and even angry responses from Christians. 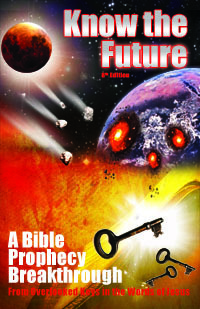 Most Christians have never heard of these prophecies or simply think God "would never allow such an affront to Christ to happen, recrucifying Christ" (Heb 6:6). If this is you, I suggest you read the explanations in the links in the preceding paragraph. Or to remember that God has allowed far worse to happen already in history than animal sacrifices after Jesus' one sacrifice that covers intentional sin (which animal sacrifices never covered nor were intended to cover - Heb 10:4, 3). God will allow even worse than that in the future such as real monsters to be unleased upon the earth that torture people into taking the mark . Therefore, I'm sorry to say that whether Jewish animal sacrifices are right or wrong, and whether you like them or not, according to clear prophecies they are coming and God will allow them. Perhaps by now you can understand why I didn't bat an eye nor did my heart flutter when I heard the news of the latest red heifer birth announcement. For one, I know there is no "red heifer prophecy" of an end time red heifer as a sign or anything else. It's not directly required for end time events by any written prophecy. The 2018 red heifer or a subsequent one will make it to three years old without blemish and be turned to ashes. The lost cache of the ashes of the last red heifer will be found. Yes, now that would seem to be a whole lot less likely to happen than #1, but it is not without precedent! The discovery of the Dead Sea Scrolls inside a lost cave by a Bedouin shepherd comes to mind . Lacking the ashes, but seeing a clear path to Temple construction after the removal of the Dome of the Rock in the Psalm 83 War, the Jews may just make up a another halachic decree that works around ash dilemma. They are very good at this! If I had to guess, since God wants to encourage and facilitate the construction of the Third Temple for the Antichrist to deceive the world from , I suspect #1 is indeed what will happen. I'm just saying it's not required nor is this red heifer a sign because there is no end time prophecy about it and those two other possibilities exist to work things out with a new red heifer. When will that war come? Only God knows, but as I wrote earlier, I believe the 2018 US embassy move to Jerusalem has helped it along . Until then, who knows how many more red cows will be born and disqualified? P.S. "Wait, in the picture above the mother is red, too! Is she 2000 years old, then?"